Gilliane has been using cork sheets from Mike Wye to upgrade her hives, which are from Thornes and made of English Cedar. Cork is about 2.5 times better an insulator than cedar. This picture of the removable window cover gives an idea of how well wrapped her bees are now. The dark layer is cork, and there is a thin layer of ordinary ply on the outside for weather resistance (though inretrospect marine ply may have been better). Gilliane has covered the (flat) roof with a water repellent membrane as the original wood got wet through after a year. She sprinkled water on the material and drops rolled like marbles or mercury atop the roof: it sheds water brilliantly. 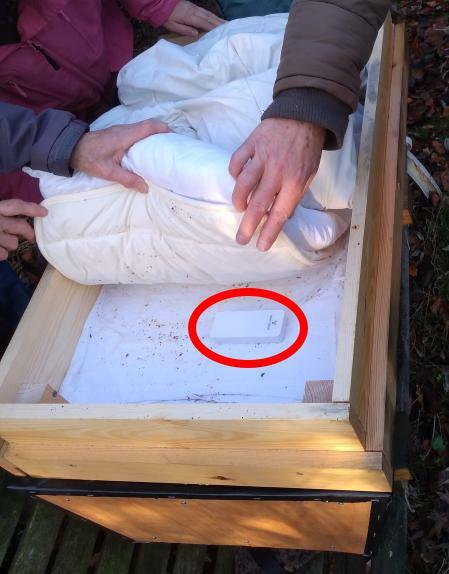 We discussed the usual winter preparations like fitting mouse guards (bees can’t defend their entrances when they are clustering in the cold), and ensuring hives cannot blow over in winter gales. The BBKA has to suggest a worst case stores requirement, covering the whole of the UK. Oxfordshire is not Scotland. The BBKA advice may date back to the era of thin walled Nationals. Paul’s hives are either Warres, or TBHs with added insulation. These are intrinsically better insulated than Nationals and have a smaller cavity to heat. The BBKA’s advice to feed in Autumn if stores are low, stimulates late laying. This results in many more mouths to feed – in fact the BBKA reckons you “need” 5 frames of bees to get through winter. Paul’s winter clusters die back to much smaller than this, sometimes fist-sized, without problems in Spring. The BBKA strategy maximises the number of bees available for harvesting spring blossom from fruit trees, but as Paul’s hives are static, in an area with only modest Spring blossom, stimulative feeding is just a waste of sugar. The local bee stock has a laying rhythm attuned to actual forage availability. Gilliane uses this wireless temperature measurement system (£49.96) to monitor temperatures in and around her active TBH. The sensors are battery powered and two are placed above the bars, under extra insulation she’s filled the roof with. 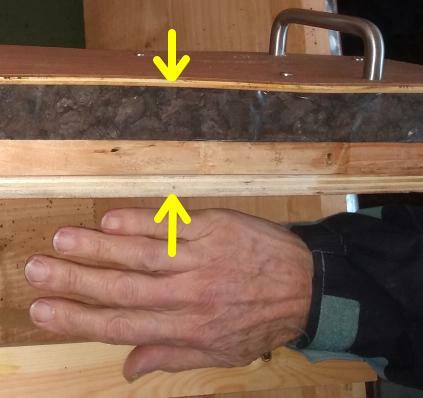 Although not touching actual bees or comb, this averages and reflects the activity in the hive cavity below. Another monitors external temperature. The graph shows some results. 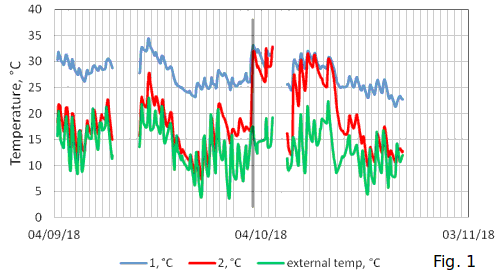 Sensors numbers 1 (blue) and 2 (red), above different bars, track the slow changes in ambient (green) trace over several days, but smooth out the rapid fluctuations, showing how the bees contrl their environment. Sensor 1 must be above brood because it’s significantly warmer than ambient; sensor 2 is above an area where activity, and thus extra warmth, is more intermittent. There has been increasing interest in instrumentation recently. 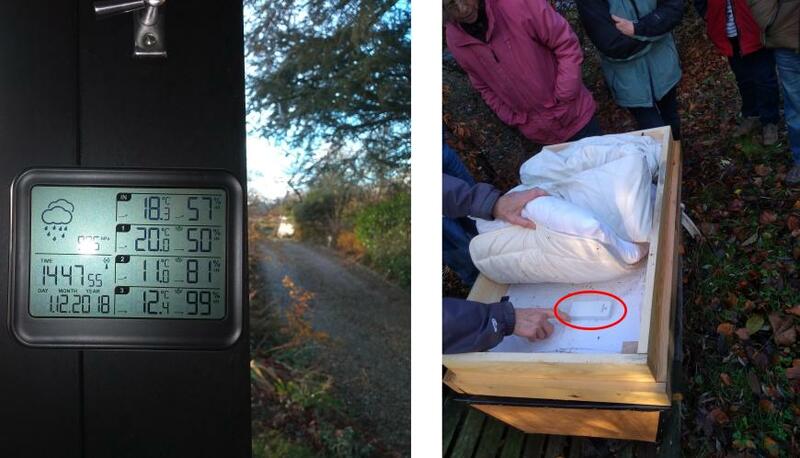 Temperature is relatively easy, and useful – giving you a non invasive clue to the health and activity of a hive. In addition to Gilliane’s WiFi temperature monitoring, Brian monitors temperature using a datalogger with a removable memory card as his hive is beyond WiFi range. Jack wired up his hive for sound, using physical wires to a speaker in his kitchen. Another useful metric is real time monitoring of weight, but placing an entire hive on a permanent scale can be tricky. We have heard of people monitoring humidity, but it’s not clear if that’s very useful. There’s always a tradeoff between “this would be fun / useful” and how expensive and difficult something is to achieve. Perhaps the key point with hive monitoring is, does it give you something you can’t get another way? For example you can, for a price, equip remote apiaries to send you a text message if a hive is moved. Huge thanks to Gilliane for opening her home and apiary to a bunch of beekeepers, the cake and biscuits, and giving us so much to think about! This entry was posted in Meetings, TBH and tagged Cork, Insulation, temperature sensors. Bookmark the permalink. Hello Oxford Natural Beeks, I fed my bees fondant yesterday, 1000 grams divided between 3 einraumbeute hives. No honey has ever been removed from these hives but two only began their lives in my garden last May. I fed them yesterday only due to fairly warm winter situation of around 8°C, we have only had 1 day with snow and no freezing as yet at all. This is very unusual here and may well cause the bees not to really cluster which means they use more energy and therefore deplete their stores faster. It is hopefully a precaution only. I have one flowering Manuka bush about 3 meters from one of the hives but I have seen no foraging bees out and about. Both purple and white flowing nettels are plentiful too, but I don’t know if it is warm enough for them to be offering nectar for bees. Next year I am going to line my still unused einraumbeutes with cork and then try to get the bees to move house so that I can modify the other three. Thank you for this good idea.